If you love garlic-laden foods but hate the lingering garlic breath that follows, we’ve got good news. The solution is just as tasty as the problem. We all know what it’s like. You head out for lunch and enjoy a delicious Caesar salad or a plate of fettuccini Alfredo, only to discover the garlic smell is lingering on your breath. Panic sets in when you remember the important meeting later that afternoon. Or, maybe you’re on a date and you forget about the romance part until after you order the garlic chicken with garlic smashed potatoes. Since most of us don’t travel with a toothbrush, that garlicky meal is likely to wreak havoc for hours. Translation: They tested various foods to find out what kills garlic breath. The researchers found three that perform best at reducing bad breath caused by garlic. They are the raw versions of mint, lettuce and apples . Which is the best of these three? They found that the raw lettuce and apples reduced the smell by 50% whereas the raw mint deodorized garlic smells by 75%. These foods deodorize breath thanks to the enzymes and the phenolic compounds found in the raw foods. Cooked or juiced versions of these three foods were not as effective. 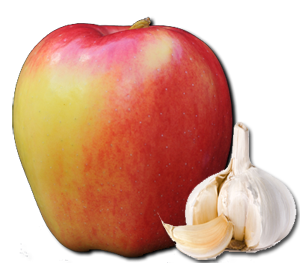 In our opinion, the apple still wins out in that battle for ‘best garlic breath combatant’ because let’s face it, what would you rather have for dessert – a sprig of raw mint, a few leaves of lettuce or a crisp, juicy apple? Add to that the teeth cleaning benefits of eating an apple and you have a clear winner. So go ahead and enjoy that roasted garlic soup, hummus, garlic shrimp or a big Caesar salad; just save a little room for an Ambrosia apple afterward. Your colleagues, friends and loved ones will thank you.